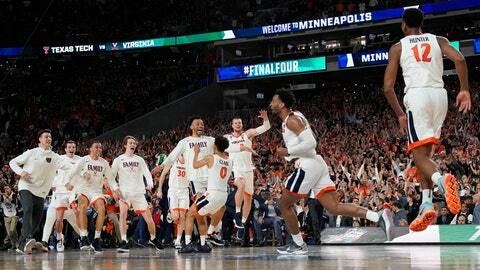 MINNEAPOLIS (AP) — Virginia has been a titan of defense, its pack-line squeezing the life out of teams, racking up wins. Offense has always been another, unfinished part of the story. It held the Cavaliers back from reaching the Final Four, and kept them on the wrong end of history just a year ago. They wrote the biggest chapter in program history Monday night — yes, with their offense. Riding the broad shoulders of De’Andre Hunter, Virginia picked apart one of the nation’s best defenses and beat Texas Tech 85-77 in overtime to win its first national title. Defensively-minded, the Cavaliers (35-3) turned a night of adjustments against Texas Tech’s vaunted defense into one of college basketball’s great redemption stories. The loss to No. 16 UMBC will never be erased, but the taste has turned from sour to sweet in a year. Hunter was the catalyst, scoring 27 points and grabbing nine rebounds. He had plenty of help from Virginia’s better-than-last-year offense. Kyle Guy scored 24 points, Ty Jerome 16 and the Cavaliers made 11 3-pointers against the most efficient defense the past 17 years. Redemption, a year after spirit-crushing defeat. “We came in together and said that we were going to win a national championship, and to be able to hug each other with confetti going everywhere and say we did it, it’s the greatest feeling I’ve ever felt in basketball,” Guy said. It took a night of schematic counterpunching to get the Wahoos to the top. The average sports fan wants to see dunks, baskets in transition, revolving numbers on the scoreboard. The Red Raiders (31-7) and Cavaliers are not that. Their game is a different kind of beautiful, one based on brawn and beating a man to his spot. That’s exactly what happened early Saturday night. First media timeout: 5 combined points, one made field goal in nine shots. The Cavaliers adjusted to the Red Raiders’ constant switching by getting the ball to the middle and mixing in motion offense while building a 10-point lead. Texas Tech spent the early part of the game trying to beat the shot clock while Virginia switched and hard-hedged screens, forcing the Red Raiders to heave shots well away from the basket. With coach Chris Beard yelling for them to push the pace, the Red Raiders countered by getting into their offense quicker and moving the ball better. An 18-4 run pulled them within 31-28 at halftime. The pawns kept changing positions in the second half. Texas Tech went small when big man Tariq Owens picked up his third foul, so Virginia’s Tony Bennett did the same. With more spacing, both teams went on a scoring spree, so Beard put Owens back in. Virginia big man Mamadi Diakite followed him from the scorer’s table. Virginia went up 10 behind Hunter and Guy getting hot, beating the Red Raiders with a series of individual moves. Moretti, Matt Mooney and Brandone Francis brought Texas Tech back by shooting over the top of the Cavaliers, hitting a string of 3-pointers. With Texas Tech up 68-65, Jerome did his one-on-one thing, beating a defender off the dribble to find Hunter in the corner for a 3-pointer. Texas Tech wanted to foul, but the usually-deliberate Cavaliers attacked too quickly — imagine that? — and Hunter knocked it down with 12.9 seconds left, sending the game to overtime. Hunter hit the big shot in overtime, too, a 3-pointer that put the Cavaliers up 2. Jerome hit a pair of free throws, then Guy. Diakite did the same and Braxton Key had the exclamation mark with a breakaway dunk. Defined by its defense, Virginia is national champions because of its offense.